NASHVILLE – The 73rd annual meeting of the Tennessee Electric Cooperative Association was held Sunday – Tuesday, Nov. 23 – 25, at the Nashville Airport Marriott. The theme of the meeting was “Powering Everyday Life,” and Dan Rodamaker, president and CEO of Gibson Electric Membership Corporation and president of the TECA board of trustees, called the meeting to order. Representatives from 23 member systems and one associate member were present for the business meeting. 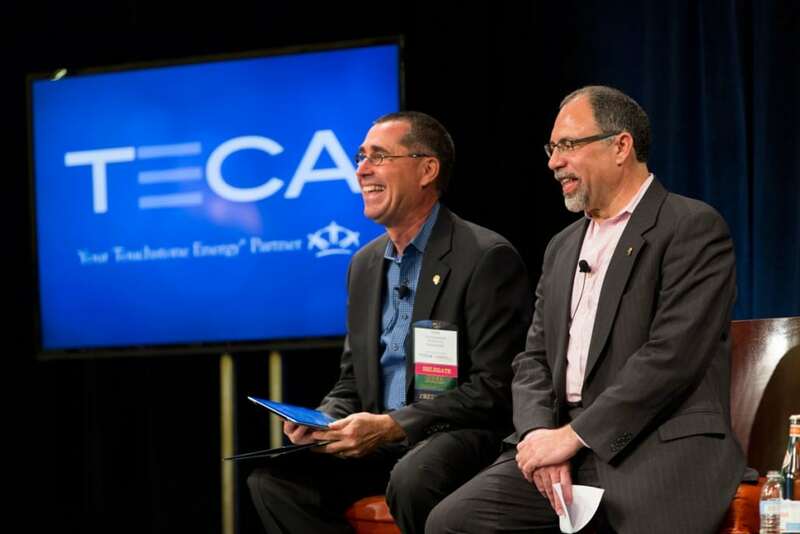 Rodamaker and TECA General Manager David Callis, the resolutions committee, TECA staff and representatives from the National Rural Electric Cooperative Association and National Rural Telecommunications Cooperative presented reports and updates. Elections were held for four-year positions on the TECA board of trustees. John Collins, general manager of Chickasaw Electric Cooperative, was elected from Region I. Joe Mullins, Upper Cumberland Electric Membership Corporation board member, was elected from Region II. Joe Atwood, Mountain Electric Cooperative board member, was elected from Region III. Jim Code, general manager of Cumberland Electric Membership Corporation, Johnnie Ruth Elrod, director at Meriwether Lewis Electric Cooperative and Randell Myers, CEO and general manager of Powell Valley Electric Cooperative, were elected to the TECA board of trustees. Throughout the year, TECA presents training and education programs for cooperative directors. Recognized at this year’s annual meeting, board members receiving Credentialed Cooperative Director status were Lee Armstrong, Plateau EC; Brian Boyatt, Plateau EC; Ronnie Fisher, Forked Deer EC; Bobby Gravitt, Sequachee Valley EC; Joseph Miller, Tri-County EMC; Edward Oliver, Cumberland EMC; Tom Perkey, Middle Tennessee EMC; Andrew Porch, Meriwether Lewis EC; Angela Talent, Fort Loudoun EC; and Gerald Taylor, Tennessee Valley EC. Board members receiving the more involved Board Leadership certification were J. Steve Roller, Caney Fork EC; Michael Mason, Cumberland EMC; Joe Tucker, Duck River EMC; Janine Wilson, Fayetteville PU; James R. Pugh, Fort Loudoun EC; Keith Carnahan, Meriwether Lewis EC; Zach Hutchins, Meriwether Lewis EC; Brian Boyatt, Plateau EC; Dave Cross, Plateau EC; Walter Barnes, Sequachee Valley EC; Paul Jaggers, Tennessee Valley EC; Kevin Staggs, Tennessee Valley EC; Wilbur Storey, Tennessee Valley EC; Joseph Miller, Tri-County EC; and James West, Upper Cumberland EMC. The Tennessee Magazine reception, featuring products made or produced in Tennessee, was held on Sunday evening, Nov. 23. Attendees to this year’s meeting also heard from Jack McCall, humorist and motivational speaker; Mark Aesch, business leader and writer; and Sen. Bob Corker. The Tennessee Electric Cooperative Association is a trade group representing the interests of Tennessee’s 23 electric distribution cooperatives and the 1.1 million consumers they serve. Tamper Resistant Receptacles Who is your power company?